As the Seattle Seahawks (3-4) wrap up a 20-3 victory over the San Francisco 49ers (2-5), we note that both teams are still below .500 with slightly over half a season left of play. While the Seahawks have proven they can run the table, the question is whether they are still a feared team. On a similar note, the Denver Broncos (6-0), Cincinnati Bengals (6-0), and Carolina Panthers (5-0) are enjoying undefeated air alongside the perennial powerhouses of the New England Patriots (6-0) and Green Bay Packers (6-0). But are these three teams there by scheduling or by improvement. A case can be made for each of those three undefeated teams, but we’d rather take a technical view and build a model that identifies a power ranking system for NFL games. To do this, we decide to make focus on wins and match-ups only. Our goal is to build a probability of winning a football match-up merely based on the team being present and the amount difference in points scored. We can then use that model to predict forward the remainder of the season. This model is simple and easy to interpret, however this model is simple. We stress the simplicity is both a blessing and a curse as it is easy to implement, but also does not account for several factors such as potential injuries, management of games, abilities of offenses versus certain styles of defenses, and the affect of weather on a game. With this in mind, let’s build the simple model! First, we build the covariate matrix, which is an N x 33 matrix. Here, N is the number of games played. After six weeks of action, this amounts to 91 total NFL games. The 33 results from the 32 NFL teams and whether a team is playing at home or on the road. Each row of this matrix is just an indicator function, where the teams playing are “1” and if the first team listed is at home, we mark the last column as “1”; “-1” otherwise. We note that there are only three outcomes to a game. The home team wins, or the home team loses. We will double down and ignore cases of ties. In the previous 15 years, there have only been five ties over the 3,824 regular season games. This means we then write the model to be a probability of winning given the two teams playing and the location of the game. This method is called a logistic regression. In order to apply this model, we write the probability of the home team winning as p, as the probability of the visiting team winning as 1-p. Then, we form what is called the logistic link function, g(p) = log(p/(1-p)). Since the probability of the home team winning is between 0 and 1, then so is the probability of the visiting team winning. If we divide these two numbers, then we get a number between 0 and infinity! By taking the natural logarithm of this fraction, we get a number between negative infinity and infinity. The cool part about this function is that if this value is less than zero, the visiting team should win; otherwise the home team should win. The coefficient for home-field advantage turned out to be 0.0587. This would effectively identify that the home-field team sees a linear increase in chances of winning by a value of 0.0587. For instance, if the Atlanta Falcons play at the Denver Broncos, we expect the Broncos to win since 0.2712 + 0.0587 – 0.3250 = 0.0049 > 0. This does not say the Broncos have a high probability of winning. Instead it says we expect them to win with a probability of 50.1225%. Projected standings for the NFL after Week 6, using a logistic regression model based on home-field advantage and difference in points. Now, it must be noted that these standings are quite unrealistic with two undefeated teams at the end of the season, and no accounting of injured players potentially returning (Romo) or retiring (Harvin). The AFC East is also given a bump for a few key items. First, the Patriots have been winning big. Not only that, the Steelers lost to the East, who in turn ran a high score up on the NFC West’s 49ers. Similarly, the Bills won by a large margin over the Dolphins, who in turn won by a large margin over the Titans. These small domino effect occurrences have the AFC East looking mighty. Add in an Eagles upset over the Jets; as well as a sizable defeat over the New York Giants, and the shaky Eagles build up a strong showing in the power rankings as the Giants tumble near the bottom of the list. Aside from these boundary cases, which may come back to normal in the next couple weeks, the overall projections are not too absurd. 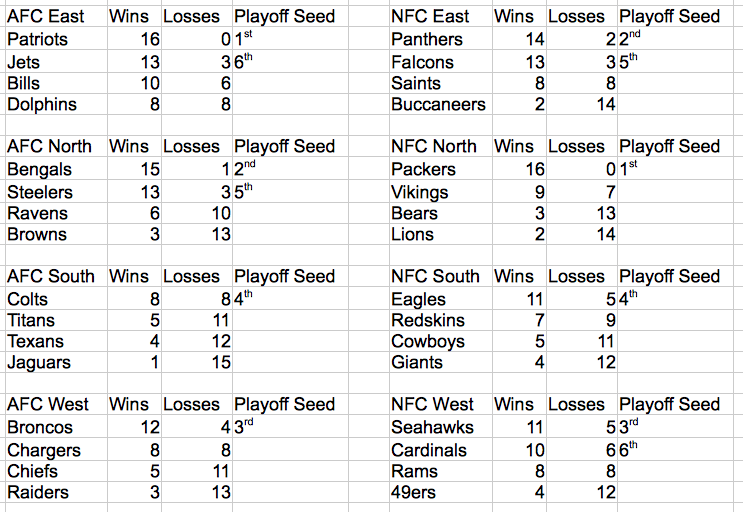 In fact, the playoff teams don’t look too far-fetched. It remains to be seen if the Jets are truly legitimate and if the Bengals can continue their strong start to the season. However, one thing for for certain. The Seahawks were given a 60.8497% chance of defeating the 49ers. And with the game recently completing with a 20-3 Seattle victory, things are looking good for the model so far.